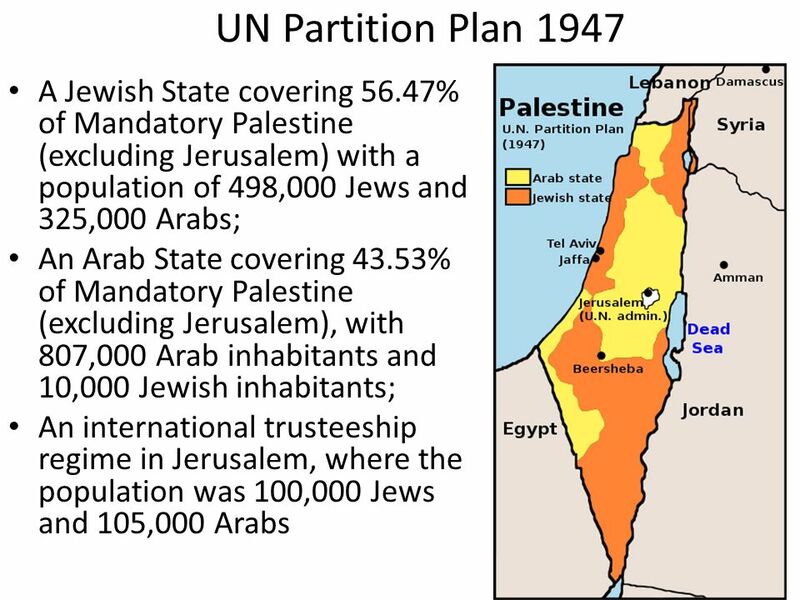 Finally, let us remind the Arab world that the UN voted for two states, not for a Jewish state only. "For several years now, I have been campaigning to declare November 29 the Jewish Thanksgiving Day; a day where we give thanks to Lady History and to the many heroic players who stood behind the historic UN vote of November 29, 1947, an event which has changed so dramatically the physical, spiritual and political life of every Jew in our generation. I have argued that Jewish communities in every major city in the world should invite the consuls general of the 33 countries who voted yes on that fateful day to thank them publicly for listening to their conscience and, defying the pressures of the time, voting to grant the Jewish nation what other nations take for granted – a state of its own. . . . This year, on its 70th year anniversary, I will celebrate November 29 by myself, if needed, and if you and you community care to join me, it would make the celebration so much more meaningful. 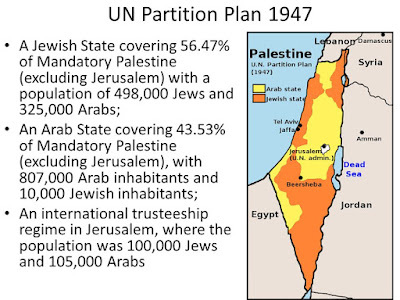 The 70th anniversary of the U.N.'s Partition Plan was commemorated with a panel discussion before an audience at Sinai Temple in Los Angeles on 27 Nov. 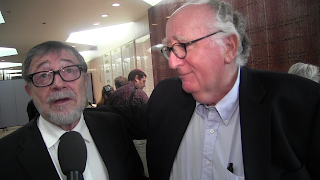 Shown in this JooTube.TV video-playlist, it was emcee'd by actor/director Mike Burstyn and featured remarks from Professors Judea Pearl, Michael Berenbaum, and Michael Bazyler. Hungarian-American Steven Geiger presented his annual Mensch Awards on that occasion to Prof. Michael Berenbaum, Meir Fenigstein (Israel Film Festival), Ms. Zane Buzby (Survivor Mitzvah Project), and Sinai Temple's Rabbi Emeritus Zvi Dershowitz. Let us give thanks to the 33 countries who voted yes on the spectacular turn that Jewish history took in November 1947, and for the dignity, pride and self-image that every Jewish soul has enjoyed since. Let us thank Cardinal Spellman, head of the Catholic Church in New York City who, days before the vote, used his personal influence in Latin American countries urging them to vote yes. Let us thank the many ordinary yet courageous people, from Peru to the Philippines, who understood the collective responsibility that history bestowed upon them in 1947, and used everything in their power, from person - al pleading to arm twisting, to get their governments to vote yes. Let us thank 33 ethnic communities in our hometowns and remind them that we Jews do not forget friends who stood with us on the side of justice – we give thanks and ask for nothing in return. And while we thank history for its miracles, let us remind ourselves and others of a few basic facts. Let us remind the world that Israel is there by historical right, not by force or favor. Brooklyn-born, Aaron Adler, a first-responder with Israel's Magen David Adom, is reunited with rescued 20-year old Israeli, Gilad Mezamer. Gilad tells the story of having been stabbed in head by Muslim Arab in Kiryat Arba, near Hebron, Israel and how he was rescued by Magen David Adom. Recorded in Beverly Hills, Oct 30, 2017. Israel's Fauda (Netflix) and Reshet 13's action drama television series Mossad 101 had their world and U.S. second season premieres, respectively, at this year’s 31st Israel Film Festival in Los Angeles, each followed by a television panel featuring creators and talent from the shows. The events were held last week at Laemmle's Ahrya Fine Arts Theatre in Beverly Hills. In “Mossad 101” (“Hamidrasha” Hebrew for “The Academy”) cadets from every level of Israeli society undergo intense training to join their country’s elite, classified intelligence service, the Mossad. Two-years ago, Israel Film Festival organizer Meir Fenigstein (drummer in "Ha Lehakah" 1977 and band "Poogy") introduced "Fauda" to American audiences- which led to C.A.A. selling the subtitled action/suspense series' rights to Netflix. This year, the Fest debuted the 2nd season opener to Israeli series "Mossad 101," which Adam Berkowitz of C.A.A. TV intends to sell the format rights to internationally. (Arrows advance you through the Playlist). The November 15th "Mossad 101" screening was followed by a live, “Israeli TV: An American Success Story” television panel, sponsored by Reshet Media was held which included moderator Adam Berkowitz, TV honcho at Creative Artists Agency along with C.A.A. Formats agent Michael Gordon; David Shore (TV writer, "House," "The Good Doctor"); actor Tsahi Halevi (in both "Mossad 101" and "Fauda"); and Sumayoko executive producer Udi Segal. 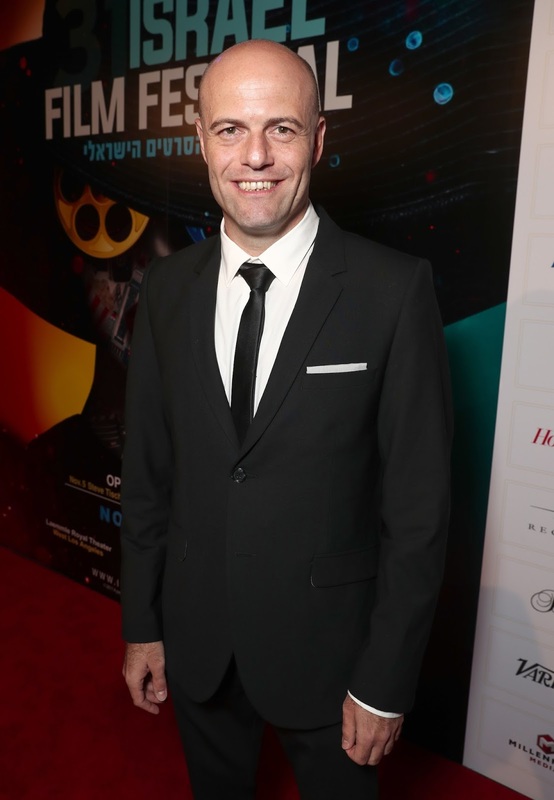 The 31st Israel Film Festival opened in Beverly Hills on Sunday November 5th with a gala, opening- night screening of director Yariv’s Mozer’s transcendent documentary "Ben-Gurion, Epilogue." Mr. Mozer discovered a lost candid interview given by an 82-year old Ben Gurion (in 1968), who had withdrawn from politics five years prior. Mozer's documentary is a fascinating account of one of Israel’s most remarkable statesman. What’s distinguishes the Israel Film Festival of Los Angeles from other Jewish film festivals is that the mandate of the founder Meir Fenigstein and festival chairman Adam Berkowitz (Co-Head of Television at Creative Artists Agency), is to not only showcase films from Israel, but to promote talented Israeli directors, writers, producers and actors in Hollywood. Mr. Berkowitz has been instrumental in helping introduce both American and international audiences to Israeli films and hit Israeli TV series' such as Fauda and Mossad 101, currently on Netflix. Along the premiere's red-carpet festival luminaries spoke with JooTube. Responding to why was he feels it important that international audiences see his compelling documentary about David Ben-Gurion, Mozer told us his hop that people all over the world “will be inspired by the way he [Ben-Gurion] takes the bible as a moral guide to the Jews in the land of Israel in the remaking of the Jewish state. Current leaders rarely share their vision about the values of the Jewish people and the goals in the land of Israel," he added vaguely. I challenged Mozer to share how making his film personally changed his life and attitude towards his beloved country and his response was candid and heartfelt, reminding me of Ben-Gurion himself in the documentary. In screening his documentary, I was consistently impressed with Ben-Gurion’s genuine humility and no-nonsense down-to-earth sensibilities. He was a great statesman who chose to withdraw from politics and live simply on a small, new settlement in the desert. When asked about his personal contributions to Israel, he had no false humility, but stated simply that one man can’t change everything. It was all of the people around him who helped create and guide the state of Israel. The Ben-Gurion we meet is funny, sincere, direct and incredibly wise. Regardless of your personal politics, you have to be impressed by how much Ben-Gurion stayed true to his convictions. When asked about giving away land, he was adamant that he would never give back Jerusalem or the Golan Heights, but that he would, albeit reluctantly, give back all the other territories to have a lasting peace in Israel. What really distinguishes Ben Gurion from modern day politicians is his resolute refusal to condemn or blame other politicians. When asked about Golda Meir, although Ben Gurion did not see eye to eye with her, but he never says a negative word about her or any of his political contemporaries. He’s direct but never hurtful in any way. It’s impossible not to be inspired by this documentary - by Prime Minister Ben-Gurion himself and by the film’s director Yariv Mozer. May we all be blessed to joyously reclaim our responsibility to commit to living a life of higher values, both personally and nationally. 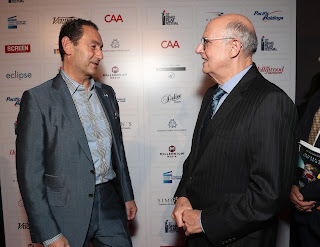 Honorees at the opening gala for the 31st Israel Film Festival included Jewish actor Jeffrey Tambor, who was presented the IFF Achievement in Television Award and Israeli actor Lior Ashkenazi, who received the IFF Cinematic Achievement Award. Mr. Tambor, 73, an Emmy and Golden Globe winning actor has been making TV audiences laugh for over 4 decades. He’s best known for his brilliant award-winning work as a trans-gendered Jewish father / mother in "Transparent" currently on Amazon Video. Mr. Tambor also received numerous Emmy Award nominations for his work on Arrested Development and on The Larry Sanders Show. Having personally admired his work for many years, I was determined to ask Mr. Tambor something about his spirituality. I asked if he would offer a bracha to JooTube viewers. I suspected he might be surprised. I couldn’t resist taking the opportunity to give Mr. Tambor a blessing in return. As I blessed him he was touched and jokingly asked if I could follow him around 24 hours a day and bless him. He took a very personal interest, even asking my name. It was evident that Tambor is soulful and kind, both personally and professionally, as well as being spontaneously funny. Even though Mr. Tambor has received and been nominated for many Emmy and Golden Globes, he revealed that he was nervous about receiving the award from the Zionist organization. When I asked why he said, “I am a Jew - and this is important! I wish my rabbi were alive to see this,” he added. Upon receiving his award on stage at the Saban Theater, he shared a funny story about being kicked out of cheder (Hebrew school) for asking too many questions.